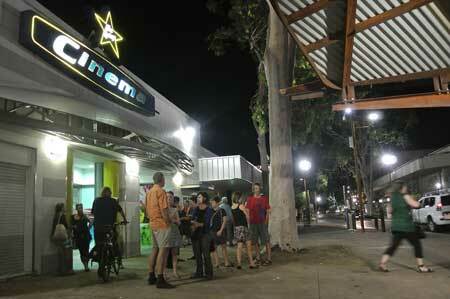 Another innovative move by the Alice Springs Cinemas builds on its commitment to enlivening Todd Street North and encouraging a richer film culture in town. They’ll host a movie festival over the coming weekend that gets away from the diet of mainstream new releases. There’ll be foreign films, documentary, art-house, action and comedy and a festival atmosphere with foyer and alfresco dining and wining. The program kicks off on Friday evening with Swedish comedy, The 100 Year Old Man Who Climbed Out the Window and Disappeared. It’s based on an international best-selling book recounting the unlikely story of a centenarian who decides it’s not too late to start over. Rotten Tomatoes gave it three and a half stars; Margaret and David, three and three and a half respectively; but the Sydney Morning Herald reviewer gave it a grumpy one in keeping with the one laugh he got from it. What We Do in the Shadows, a horror, comedy, mockumentary from New Zealand, follows up as the later Saturday offering. The ‘we’ are Viago, Vladislav and Deacon, three vampires sharing a flat and haunting the streets of suburban Wellington. It got four stars from EMPIRE – “a gag-filled delight”; and five from Rotten Tomatoes – “a sharp little character-driven comedy that gets its laughs not so much from the plot but simply from its cast of weirdos”. Margaret and David, however, couldn’t “get on the wavelength” and gave it only one and half and one star respectively, while The Australian’s reviewer described it as “a wretchedly ugly and unfunny affair”. Festival weekend rounds off on Sunday night, starting with The Selfish Giant (still at right), a British film inspired by the Oscar Wilde story of the same name. It won the Europa Cinemas award at the 2013 Cannes Film Festival, Best Film at the 24th Stockholm International Film Festival, and Peter Bradshaw of The Guardian gave it five stars as did Rotten Tomatoes. Margaret gave it four stars, finding that it “absolutely captured the world of alienated kids in an economically depressed area so tragically, so beautifully”; David, however, only gave it three. The wrap comes with Snowpiercer, a Korean science fiction arthouse action film based on the French graphic novel Le Transperceneige. Jason De Rosso (ABC) described it as “a beautifully made science fiction allegory about the perversions and arrogance of power” and “a damn good action movie as well”, giving it four stars. Rotten Tomatoes gave it five stars and Metacritic, four.